St. Joseph, the spouse of the Blessed Virgin Mary and the foster-father of Jesus, was probably born in Bethlehem and probably died in Nazareth. His important mission in God's plan of salvation was "to legally insert Jesus Christ into the line of David from whom, according to the prophets, the Messiah would be born, and to act as his father and guardian" (Directory on Popular Piety and the Liturgy). 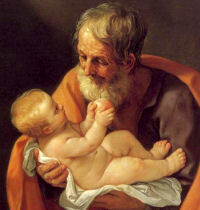 Most of our information about St. Joseph comes from the opening two chapters of St. Matthew's Gospel. No words of his are recorded in the Gospels; he was the "silent" man. We find no devotion to St. Joseph in the early Church. It was the will of God that the Virgin Birth of Our Lord be first firmly impressed upon the minds of the faithful. He was later venerated by the great saints of the Middle Ages. Pius IX (1870) declared him patron and protector of the universal family of the Church.